So we have this book. 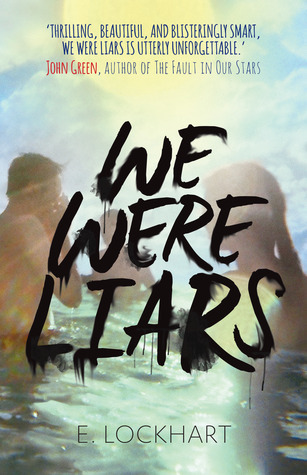 I’m not sure how I am meant to feel after completing We Were Liars, but I know one thing; Emily Lockhart’s use of descriptive language kinda stole my heart. I honestly can’t tell you if I would have wanted to finish the book if it wasn’t for her writing. That is to say this books target audience is teenagers, which I believe is the primary reason it didn’t really appeal to me. I do love a good YA book, but this one was a bit odd. While the language and writing was stunning, the story for me felt predictable and almost like it was written backwards.. or inside out.. or something that’s just not straight. However it was good enough to hold me until to the end. I wanted the answers. The story is based from Cadence’s point of view. We watch as she, her two cousins Mirren, Johnny and friend Gat grow together each summer on the Sinclair family Island. It leads us up to the fifteenth summer in which a tragic accident happens, one we have to piece together as Cadence’s memories slowly come back to her. The book focus’ on the dynamics of an entitled family who are at constant battles with each other. Its like looking through a window into an overly privileged, highly dysfunctional family. The potential was there somewhere though, I may have been more effected by the tragedies throughout this book if I felt more connected to the characters themselves. But this book was very singular in the way it was focused on Cadence. After all of that I do think this book has some good messages, there is a lot you can take from it. From my observation you’re going to love it or hate it. As for me, I loved the language, the messages were there, but the story line not so much.